Cary /ˈkæri/ is the seventh-largest municipality in North Carolina. Cary is predominantly in Wake County, with a small area in Chatham County in the U.S. state of North Carolina and is the county's second-largest municipality, as well as the third-largest municipality in The Triangle of North Carolina after Raleigh and Durham. The town's population was 135,234 as of the 2010 census (an increase of 43.1% since 2000), making it the largest town and seventh-largest municipality statewide. As of April 2018[update], the town's estimated population was 162,025, though Cary was still considered a town because that is how it was registered with the state. Cary is the second most populous incorporated town (behind only Gilbert, Arizona) in the United States. According to the US Census Bureau, Cary was the 5th fastest-growing municipality in the United States between September 1, 2006, and September 1, 2007. In 2015 Cary had a low crime rate of 84 violent crimes per 100,000 residents. Charlotte, the largest city in North Carolina, had a violent crime rate of 648 violent crimes per 100,000 residents, almost 8 times higher than Cary. Raleigh, Durham, and Chapel Hill make up the three primary metropolitan areas of the Research Triangle metropolitan region. The regional nickname of "The Triangle" originated after the 1959 creation of the Research Triangle Park, primarily located in Durham County, four miles from downtown Durham. RTP is bordered on three sides by the city of Durham and is roughly midway between the cities of Raleigh and Chapel Hill, and the three major research universities of NC State University, Duke University, and University of North Carolina-Chapel Hill. Effective June 6, 2003, the U.S. Office of Management and Budget (OMB) redefined the Federal statistical areas. This resulted in the formation of the Raleigh-Cary, NC Metro Area and the Durham-Chapel Hill, NC Metro Area. The Research Triangle region encompasses OMB's Combined Statistical Area (CSA) of Raleigh-Durham-Chapel Hill in the central Piedmont region of North Carolina. As of 2012[update], the population of the Raleigh-Durham-Chapel Hill CSA was 1,998,808. The Raleigh-Cary Metropolitan Statistical Area (MSA) as of Census 2010 was 1,130,490. In 1750, Cary began as a settlement called Bradford's Ordinary. About 100 years later, the North Carolina Railroad between New Bern and Hillsborough was constructed through the town, linking Bradford's Ordinary to a major transportation route. Allison Francis "Frank" Page is credited with founding the town. Page was a Wake County farmer and lumberman. He and his wife, Catherine "Kate" Raboteau Page bought 300 acres (1.2 km2) surrounding the railroad junction in 1854 and named his development Cary, after Samuel Fenton Cary (a former Ohio congressman and prohibitionist he admired). Page became a railroad agent and a town developer. He laid out the first streets in Cary and built a sawmill, a general store and a post office (Page became the first Postmaster). In 1868, Page built a hotel to serve railroad passengers coming through Cary. Cary was incorporated on April 3, 1871, with Page becoming the first mayor. In 1879, the Raleigh and Augusta Air-Line Railroad (later the Seaboard, now CSX Transportation) arrived in Cary from the southwest, creating Fetner Junction just north of downtown and spurring further growth. In the early years, Cary adopted zoning and other ordinances on an ad-hoc basis to control growth and give the town structure. Beginning in 1971, the town created Planned Unit Development (PUD) zoning to accommodate population growth related to the growth of Research Triangle Park nearby. A PUD allows a developer to plan an entire community before beginning development, thus allowing future residents to be aware of where churches, schools, commercial and industrial areas will be located well before such use begins. Kildaire Farms, a 967-acre (3.9 km2) Planned Unit Development in Cary, was North Carolina's first PUD. It was developed on the Pine State Dairy Farm by Thomas F. Adams, Jr. Adams named a section of Kildaire Farms "Farmington Woods" in their honor. The local government has placed a high value on creating an aesthetically pleasing town. 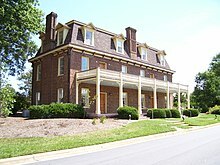 In addition to the Page-Walker Hotel, the Carpenter Historic District, Cary Historic District, Green Level Historic District, Ivey-Ellington House, and Nancy Jones House are listed on the National Register of Historic Places. Located in the Piedmont region of the eastern United States, Cary is near North Carolina's Research Triangle. It is bordered on the north and east by Raleigh, on the north and west by Research Triangle Park and Morrisville, on the south by Apex and Holly Springs, and on the west by the Jordan Lake area. The town is hilly, with much of the undeveloped land covered in dense woods. Several creeks and small lakes dot the area, most notably Lake Crabtree in the north. Nearly all of Cary is in western Wake County, with neighborhood-sized sections in the northeast corner of Chatham County. According to the United States Census Bureau, the town has a total area of 43.5 square miles (112.6 km²). 42.1 square miles (109.0 km²) of it is land and 1.4 square miles (3.6 km²) of it (3.17%) is water. As of 2010[update], Cary claims a total area of 55.34 mi². Cary has a humid subtropical climate (Cfa) under the Köppen climate classification system. It receives hot summers and mildly cold winters, with several months of pleasant weather each year. Temperature extremes here range from the negatives to over 100 degrees Fahrenheit. Hurricanes and tropical storms can affect Cary, usually after weakening substantially from being over land. Some, such as Hurricane Fran in 1996, have caused great damage in the area. Snow falls every year, averaging around 6 inches annually. Cary is divided into distinct east and west sections. The older eastern side contains the downtown area as well as the town's oldest neighborhoods. Several of the town's iconic buildings, such as the Ashworth Drug Store, Fidelity Building, and Page-Walker Hotel are in the eastern part of town. The western side is much newer and is visibly the center of wealth in Cary. Almost completely suburbanized, the area features sprawling neighborhoods, parks, and lakes. According to the 2010 Census, there were 135,234 people and 55,303 households in the town. As of 2013[update], the population has increased to 151,088. The population was 73.1% White, 13.1% Asian, 8.0% African American, 7.7% Hispanic or Latin of any race, 2.6% identified as having ancestry of two or more races, 0.4% Native American, and 0.0% Pacific Islander. The median household income for Cary as of 2011[update] was $110,609. More than two-thirds (68.0%) of Cary residents (aged 25 and older) hold an associate degree or higher, and 60.7% of adults possess a bachelor's degree or higher. Cary has one of the lowest crime rates (79% less than North Carolina) in the state for municipalities of its size. The home ownership rate (owner-occupied housing units to total units) is 72.8%. In 2013, Cary moved up in the latest rankings of safe U.S. cities and is now considered the third-safest among municipalities with populations of 100,000 to 499,999, behind Amherst, New York, and Irvine, California, according to CQ Press, publisher of the annual "City Crime Rankings 2008-2009: Crime in Metropolitan America." Cary's reputation as a community for affluent transplants from outside the South has led to backronyms for its name such as "Concentrated Area of Relocated Yankees." Data from the 2000 Census shows 29.2% of Cary residents are native to North Carolina; 55.2% were born in other states. Additionally, 15.6% of the town's population were born outside the United States. Home to North Carolina Courage of the National Women's Soccer League. Home to North Carolina FC of the USL Championship men's soccer league. WakeMed Soccer Park, where the soccer team NCFC (formerly the Carolina RailHawks) of the NASL plays. Cary has a council-manager government; the mayor and council members serve a four-year term, with half of the council seats being up for election each odd-numbered year. Four of the six council seats are elected by single-member districts; the remaining two seats are elected as at-largerepresentatives, meaning they must attract a majority of votes across the whole town. The current (as of December 2016[update]) town council consists of Mayor Harold Weinbrecht and Representatives Jennifer Robinson (District A), Don Frantz (District B), Jack W. Smith (District C), Ken George (District D), Lori Bush (at-large), and Ed Yerha (at-large). On October 9, 2007, Harold Weinbrecht defeated incumbent Mayor Ernie McAlister in the 2007 mayoral election. Citizen concerns that rapid growth was adversely affecting infrastructure and environment over the effect rapid growth was having on the town, especially on roads, schools, and the environment, led to McAlister's ouster. On December 26, 2009, The Nation reported that Immigration and Customs Enforcement (ICE) had secret prisons in the United States, where it held suspected illegal immigrants indefinitely before deportation. It reported that at least one of these secret federal prisons is allegedly located in an office building in Cary. Part of the federal government's Department of Homeland Security, ICE has leased an office in Cary for more than 10 years. The town says that no detainees are kept at this location overnight. Other than protesters of punitive ICE policies picketing the facility, the town does not acknowledge any issues associated with the Cary ICE office. Based in Cary, the Wake County Public School System is the largest public school system in North Carolina. Public transit within the town is provided by GoCary, with six fixed-routes. There is a door-to-door service for the senior citizens (60+) and riders with disabilities. GoTriangle operates fixed-route buses that serve the metropolitan region and connect to the local municipal transit systems in Raleigh, Durham and Chapel Hill. Amtrak's Silver Star, Carolinian and Piedmont passenger trains stop at the Cary Amtrak station. They offer service to Charlotte, New York City, Miami, and intermediate points. In 2010 the League of American Bicyclists designated Cary as one of the fourteen recipients of the first Bicycle-Friendly Community awards for "providing safe accommodation and facilities for bicyclists and encouraging residents to bike for transportation and recreation". The Maine-to-Florida U.S. Bicycle Route 1 passes through suburban Cary, as does N.C. Bicycle Route #2, the "Mountains to Sea" route. Cary Greenways and Trails maintains a network of sidewalks and paved trails connecting neighborhoods and parks throughout the town. These greenways place strict requirements on environmental conditions to preserve a park-like atmosphere. In addition, standard sidewalks and paths exist throughout the town. The Raleigh-Durham International Airport, north of Cary via Interstate 40 between Cary, Raleigh and Durham, serves Cary and the greater Research Triangle metropolitan region. Raleigh-Durham offers more than 35 destinations, serving approximately 9 million passengers per year. U. Alexis Johnson, senior Foreign Service Officer with the U.S. Department of State who was born in Kansas, resided here near the end of his life, and is buried in D.C.
Money Magazine Best Place to Live ranked Cary as #5 in the nation in 2006. ^ "TOC - Q4 Quarterly_2.1.17". townofcary.uberflip.com. ^ U.S. Census Bureau. "American FactFinder - Results". factfinder.census.gov. 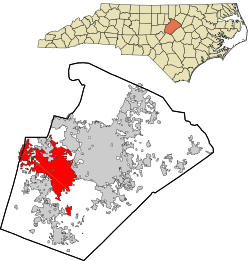 ^ "Subcounty population estimates: North Carolina 2000–2009". United States Census Bureau, Population Division. 2010-06-22. Archived from the original (CSV) on 2010-06-26. Retrieved 2010-09-30. ^ Bolejack, Scott (2018-04-02). "Should Cary call itself a city or a town? Does it even matter?". News & Observer. Retrieved 2018-04-03. ^ Wallace, Nick (November 16, 2015). "The Safest Cities in America". SmartAsset. Retrieved November 18, 2015. ^ "Population Estimates 2012 Combined Statistical Areas: April 1, 2010 to July 1, 2012". U.S. Census Bureau. Archived from the original on March 17, 2013. Retrieved March 14, 2013. ^ "Looking Back". Cary, North Carolina. Archived from the original on 2010-06-08. Retrieved 2010-05-23. ^ "Town of Cary - Our Community". Cary, North Carolina. Archived from the original on 2014-06-20. Retrieved 2014-05-22. ^ Weather Channel. "Cary, NC Weather". Weather Channel. Retrieved 2010-04-05. ^ "10 safest places to live in the US". www.clevelandsecuritybloggers.com. Archived from the original on 28 June 2016. Retrieved 27 June 2015. ^ Bourne, Joel. "Suburbia Unbound". National Geographic. Retrieved 2007-04-16. ^ "America's most unusual planned communities". CNN Money. Archived from the original on 2010-07-27. Retrieved 2010-07-28. ^ "Money Magazine Article - Part 2". Cary Chamber of Commerce. Archived from the original on June 6, 2009. Retrieved 2010-05-23. ^ "All About Lazy Daze". Cary Citizen. Archived from the original on 2010-08-23. ^ "NC Eid Festival". Archived from the original on 2010-08-12. Retrieved 2010-11-12. ^ Cary Parks: Sk8 Cary Skate Park, Cary, North Caroline. Retrieved 2012-04-16. ^ Cary Parks: MacDonald Woods, CaryCitizen, November 3, 2010. ^ "Lochmere Golf Club". Lochmere Golf Club. Retrieved 2019-03-16. ^ "Prestonwood Country Club". Prestonwood Country Club. Retrieved 2019-03-16. ^ "MacGregor Downs Country Club in Cary, NC". MacGregor Downs Country Club. Retrieved 2019-03-16. ^ Carlson, Kelcey (2007-10-09). "Town of CaryWeinbrecht Wins Upset in Cary Mayoral Race". WRAL News. Capitol Broadcasting Company. Retrieved 2010-05-23. ^ Stevens, Jacqueline (2009-12-16). "America's Secret ICE Castles". The Nation. Katrina vanden Heuvel. Retrieved 2010-07-20. ^ Cary History: Frank Page, CaryCitizen, 22 April 2010. ^ Profile: Former Cary Mayor Koka Booth, CaryCitizen, June 30, 2010. ^ "Fixed Route Service". www.townofcary.org. Archived from the original on 2016-10-12. Retrieved 2016-10-10. ^ "GoCary Door to Door Service". www.townofcary.org. Retrieved 2016-10-10. ^ "Maps & Schedules | GoTriangle". gotriangle.org. Retrieved 2016-10-10. ^ a b "Greenways". Cary, North Carolina. Retrieved 2010-05-23. ^ "Best Places to Live 2006". CNN. 2006. Archived from the original on December 21, 2006. Retrieved 2010-05-23. ^ "Interactive City Directory". Sister Cities International. Archived from the original on 2014-11-06. Retrieved 5 November 2014. ^ "Sister Cities of Cary". Town of Cary. Retrieved March 16, 2019. Wikivoyage has a travel guide for Cary. Wikimedia Commons has media related to Cary, North Carolina.